A senior officer said the Marines will not undertake amphibious assaults in the mold of Iwo Jima in the future. The U.S. Marine Corps does not plan on launching traditional amphibious assaults anymore, a senior officer told reporters on Thursday. With the end of the post-9/11 wars, and the new rebalance to Asia, the U.S. Marines have been touting a return to their amphibious roots. However, the future will not look entirely the past, according to Lt. Gen. Kenneth Glueck, the commander of Marine Corps Combat Development Command. In a nutshell, the Marines “want to put strength against weakness…. We’re going to go … where they’re weak.” As part of this approach, Glueck said that the Marines will conduct most amphibious assaults at night. The reasoning behind this shift is not difficult to ascertain. As I wrote on the occasion of the D-Day anniversary earlier this month, modern defense technologies have made amphibious assaults — always one of the most complicated military operations — exceedingly difficult. In particular, amphibious operations are greatly complicated by the presence of sophisticated anti-ship missiles that are increasingly accurate at longer ranges. This necessitates that the landing craft be launched at faraway distances, making surviving long enough to reach shore, much less concentrating force, difficult. Glueck’s comments come at a time when the Marines are coming under heavy criticism for their failure to adapt to the changing realities caused by new defense technologies and the rebalance to Asia. Some have blasted the Marines for ignoring their landing craft shortfall. 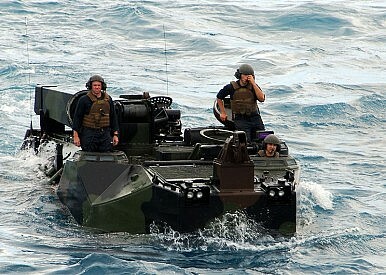 Many of these same observers have noted that even the landing craft the Marines do possess are increasingly outdated. Counted among these critics is the Commandant of the Marine Corps himself. More devastating is a recent analysis by two retired Marine officers who argued that the Marines increasingly lack the ability to get sea-based Marines “to their ashore objectives, over 100 miles across the sea, [and to] concentrate a force powerful and effective enough to engage an enemy force and strong enough to win the battle.” More importantly, the authors argued that the “Marine procurement plans exacerbate” this problem, and claimed there is an increasing disconnect between the corps’ procurement plans and “long established Navy/Marine Corps amphibious strategies” and operational and tactical concepts. They reserved especially harsh criticism for the recently unveiled Amphibious Combat Vehicle (ACV) 1.1. The vision Glueck laid out on Thursday seems to be aimed at skirting much of this criticism. After all, transporting heavy AAVs and using antiquated landing craft won’t present as large of problems if the Marines are not landing on strongly defended beaches. Interestingly, the new strategy for amphibious assaults, at least as explained by Glueck, suggest that the Marines’ lessons from a decade of war will have a sizeable influence on the service’s future. In Iraq and Afghanistan since 9/11, the Marines have essentially acted as a second land force. As such, they have had to contend with the insurgencies plaguing both of those countries. Glueck’s description of the new plans for amphibious assaults read like they were taken from Mao’s playbook on guerilla warfare. Most notably, the concepts of refusing to engage the enemy where he is strong while attacking where he is weak are classic insurgent tactics. In many ways, using insurgent-like tactics makes sense as sea-based Marines fighting competent adversaries will be at a relative disadvantage much as insurgents fighting national armies are. Then again, it’s not like the Marines of WWII didn’t try to land at uncontested points and avoid amphibious assaults on heavily defended beaches. They, of course, did these things whenever possible, and often came up with ingenious ways to make it possible. It just so happened that they couldn’t always avoid traditional amphibious assaults. The question, then, is will things be any different for the Marines of the future? What the new Star Wars film and the Chinese Communist Party's founding myths have in common.